Interlaced video looks fine on old CRT-based TV sets but appears terrible on modern LCD, plasma displays, etc. like lines, blurry images, color fuzzing specks. To make the interlaced video play normally on modern non interlaced display devices, you have to deinterlace the video first. Deinterlacing is the process of changing interlaced video into a non-interlaced one compatible with modern displays. We've discussed best Handbrake settings in my previous post, this article is about Handbrake deinterlacing videos, you'll learn how to deinterlace video with Handbrake, an awesome open source program. To deinterlace videos with Handbrake, first, click "Picture Settings" at the top-right corner; second, after opening the dialog box, choose "Filters"; third, move the slider to "Deinterlace"; Choose the deinterlacing level from the drop down menu. This is the fastest yet simplest way to deinterlace video using Handbrake, but sorry to tell you that you'll sacrifice the video quality. There's another better Handbrake deinterlacing video method, Decomb, a new filter offered by Handbrake, which is also available in the "Picture Settings". The decom filter only handles visibly interlaced videos, so you don't need to check if the video is interlaced or not. "It won't destroy the detail in progressive sources the way Deinterlace will, and should be faster than 'Slow' or 'Slower', according to Handbrake wiki. There are several different deinterlacing modes and parameters, including combing detection parameters, EEDI2 parameters, etc. which is quite confusing. Handbrake deinterlaces videos, sound perfect? The short answer is no. Issue about Handbrake Large File Size Is Solved! I don't really use Handbrake but I seem to recall the (de)interlace options were confusing. The "Decomb" filter is a bit better, but there is still some noticeable slow down. I then tried to force the output to 23.976 (I tried Peak and constant). It is a bit better but also introduces jerkiness in some panning. If you've tried to deinterlace videos with Handbrake 1.0.0, you probably stumble upon issues that speed are extremely slow, deinterlaced video quality is messing up, technical stuff is hard to understand, and many other Handbrake deinterlacing problems. Handbrake generally works good, but it can be better. Any excellent Handbrake alternative to deinterlace video? Read on. 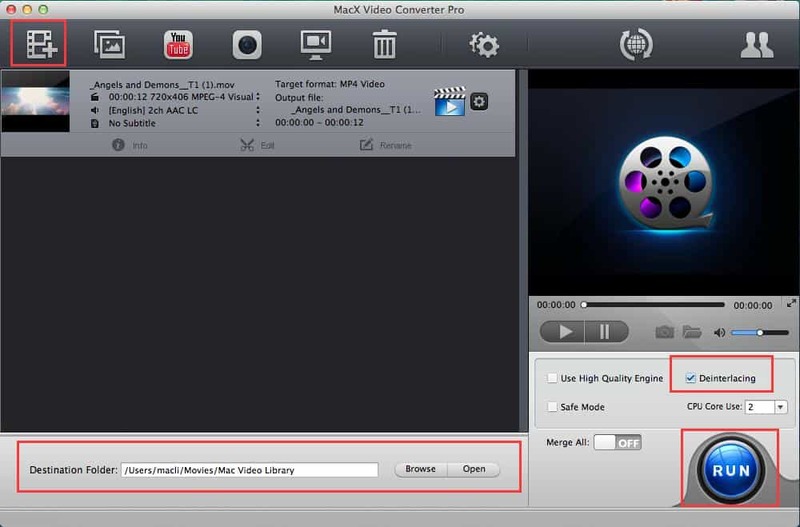 MacX Video Converter Pro, a smashing video deinterlacer, delivers the simplest way to deinterlace interlaced videos in a surprising fast speed with zero quality loss, requiring no technical mind. That means it not only saves your time but also keeps a good balance between video quality and conversion speed. It deinterlacs 1080P, 4K UHD videos in whatever video formats, be it MP4, AVI, MOV, WMV, FLV, AVCHD, VOB, MTS, DV, to name just a few on Mac OS(Mojave included). It also allows you to convert any video to over 180 video formats and 14 popular audio formats, like FLV to MP4, MP4 to MP3, FLV to AVI, WMV to MOV, to name just a few. If you encounter problems when using Handbrake to deinterlace videos, try the reliable tool that embraces more stunning features. Step 1: Free download the best video deinterlacer and run it. Click "Add File" button on the top-left corner as shows below to load interlaced video file. Step 2: Click "Browse" to select an output solder to save the deinterlaced video file. Step 3: Check the "Deinterlacing" box to deinterlace your video file. Step 4: Click "RUN" button to start the video deinterlacing process. The whole process will be done speedily. Note: it is also able to compress and split over-large interlaced video files in a single click.